You’ve got to hand it to the producers of Mamma Mia!, who sell an ‘original’ cast recording at the kiosks stationed in the foyer of the Novello Theatre. May I suggest ‘Abba Gold: Greatest Hits’ for anyone who truly wants the original music used in this long-running West End production? And whilst we are on the subject of the Novello, I take this opportunity to express gratitude to the front of house team at this theatre, who I found to be very pleasant and welcoming, providing service with a smile. What initially struck me about this show was how the songs aren’t belted out. “This is musical theatre,” I thought to myself. “Why are these great songs so understated?” Dianne Pilkington’s Donna Sheridan was so restrained during one early number she was in danger of being drowned out by the band – and we’re talking about someone who previously played Glinda in Wicked. But as the evening wore on, the moderated style grew on me until it finally clicked: these aren’t your typical musical theatre songs, they’re actually pop songs, sung (more or less) in the style they were sung by Abba themselves. For example, in that famous, simple but incredibly powerful music video of ‘The Winner Takes It All’, we don’t hear Agnetha Fältskog projecting as though she needed to be heard in the back row of the upper circle in a West End theatre. She’s singing to tell a story, and the cast in this show do so too. I could go on at some length about the skill and beauty of the lyrics from Benny Andersson and Björn Ulvaeus, but as far as this show goes, it’s Catherine Johnson’s book whose plot charts its way through the Abba back catalogue in an entertaining manner. While not all the scenes are entirely believable (one or two are, frankly, beyond absurd), it’s unusual to find a (relatively) modern musical that blends its songs so seamlessly into the narrative. I suspect you may have to go back as far as the Rodgers and Hammerstein era to find similar musicals – and, of course, those songs were originally written specifically for the shows in which they appear! Anyone only really looking to enjoy Abba’s music sung live are going to have to put up with some lengthy spoken dialogues necessary to progress the plot sufficiently. But it’s a lovely story, really, with enough twists and turns to maintain interest to the end, with a happy musical ending, but not the ending that might have been expected. Rosie (Jo Napthine) does an excellent two-hander with Bill Austin (a highly likeable Charles Daish) for a rendition of ‘Take A Chance on Me’, and Tanya (Mazz Murray) makes light weight of dismissing the advances of baby-faced Pepper (Dan Partridge). The large ensemble (there’s 21 of them when they are all on stage at the same time) provide an extraordinary song-and-dance experience during the more upbeat numbers like ‘Voulez-Vous’ and ‘Gimme! Gimme! Gimme! (A Man After Midnight)’, the latter proving a most convenient tune for a hen party that rattles on into the early hours. With the ‘musical numbers’ being so well known, it’s difficult not to sing along – fortunately, the audience is rewarded for keeping their lips sealed with a long encore at curtain call, where they shoehorn in ‘Waterloo’ after daring to ask the audience, “Do you want one more?”. Set on a Greek island paradise, this story of love, friendship and identity is cleverly told through the timeless songs of Abba. 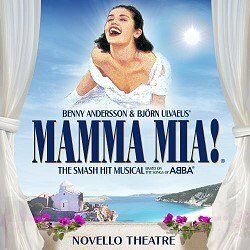 Join the ultimate feel-good party as Mamma Mia! celebrates 15 years as the world’s sunniest and most exhilarating smash-hit musical. Sophie’s quest to discover the father she’s never known brings her mother face to face with three men from her distant romantic past on the eve of a wedding they’ll never forget – all set to the timeless songs of Abba. This irresistible, sunny, funny comedy musical has thrilled over 54 million people worldwide and there’s never been a better time to see it. Whatever age you are, you can‘t help but have the time of your life at Mamma Mia! Book Mamma Mia! musical tickets for the Novello Theatre in London’s West End. Age Restrictions: Suitable for ages 5 and over.